KING COLIN wasn't clever and King Colin wasn't bold, But what made King Colin special were his underpants of GOLD. When King Colin's GOLDEN UNDERPANTS go missing and the royal bottom is bared, its Sir Scallywag to the rescue! Brave and bold, courageous and true, he's perfect knight for the job . . . and what does it matter that he's only SIX! A laugh-out-loud comic adventure proving that even the unlikeliest hero can be the bravest knight of all. There's sometimes a fine line between what will make kids laugh and what may make parents recoil, but Andreae has achieved the right balance. Yes there are bare bottoms in the book, but I believe they're tasteful bare bottoms (! ) Children won't be disappointed. They'll relish the humour, enjoy the rhyme and rollicking rhythm, and cheer as the young knight battles a wicked and stinky giant. Parents and teachers will appreciate the underlying message, that it's possible to be brave, however unlikely or small a hero you are. Paul's illustrations are simply brilliant. They're detailed, quirky, cartoonish in style and a perfect match for Andreae's tale. I love that there's so much for youngsters to pore over and discuss in the book, particularly the eyeballs and crown-sporting critter onlookers. 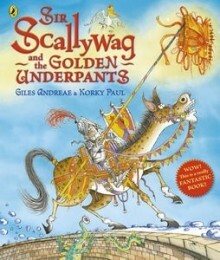 Sir Scallywag and the Golden Underpants is an excellent choice for local and school libraries. It would be a great book for when teachers want students to learn to appreciate, evaluate and create poetry as a literary text, and are looking for models. It also makes a wonderful picture book gift. Gain more of an idea of the wit and charm of Sir Scallywag and the Golden Underpants in this video below, featuring Andreae reading from his book.